1) It’s a Spanish tax identification number for foreigners. It connects you to the Spanish government and is required to do almost anything in Spain. 2) Apply. You may apply while you’re in Spain, but you must be in Spain legally. You can also apply at a Spanish Embassy or Consulate Office in your resident country. 1) Resident. This is for a citizen of the European Union (EU), Switzerland, Iceland or Norway who will live in Spain more than 90 days a year or is otherwise considered a ‘Spanish resident’. *See below for a definition. If you’re a Spanish resident, you must report and pay income taxes in Spain on your world-wide income. So don’t apply for this NIE until you speak with a Spanish tax attorney. We work with one in our office. This NIE is on a document called a ‘Certificate of Residence’. 2) Non-Resident. It’s for everyone else: all non-EU citizens and EU-citizens who are not a Spanish resident. It’s a piece of paper with the NIE written on it. It only allows you to do certain acts in Spain, such as hire utilities and buy property. It does not allow you to live or work in Spain. To do this, non-EU citizens must go through the immigration process and obtain a visa. Where Do I Get a NIE? This depends on your country of citizenship. 1) Citizens of the EU, Switzerland, Iceland or Norway in Spain apply at their local police station (comisaria). In Barcelona it’s on Rambla Guipúzcoa. 2) Non-EU Citizens. They go to the Spanish immigration office called Extranjería. In Barcelona it’s on Passeig Joan. No appointment is needed. The doors open at 9:00 am. It’s best to go early and wait in line. What Do I Need to Get a Resident NIE? You’ll need the following six documents. It’s a long list because you’ll be living in Spain. A recently dated, signed and stamped bank statement in your name only that shows you have at least 5,164.60€ in the bank. This figure as of July 2017; it’s subject to change. It applies to only one applicant. If you have dependents the amount goes up. A local bank is recommended. Health Insurance. The policy must include ambulance, hospital and have no co-pay. You’ll need the full original policy, dated, signed and stamped by the insurance company. A local company is recommended. If you have a job or job offer, ask your employer if they enrolled you in Spain’s public health system. If so you won’t need to show insurance. 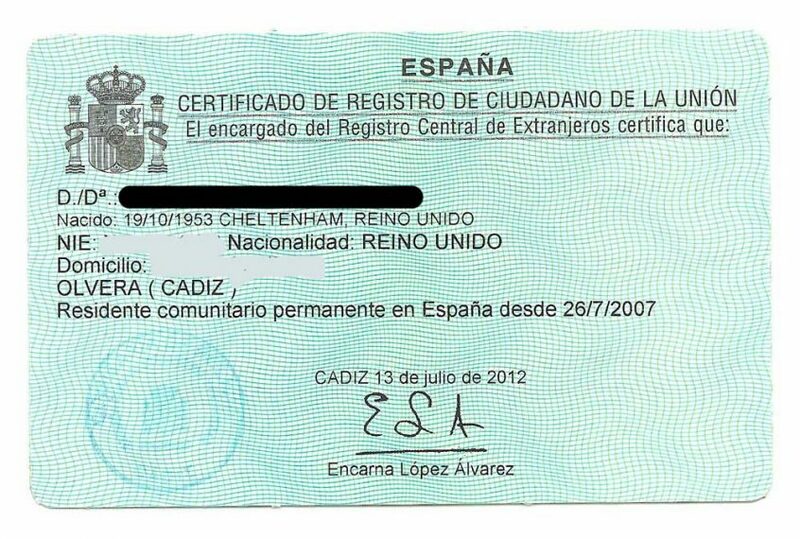 Resident Registration (Empadronamiento) certificate. You must register yourself as a resident with the city government (Ayuntamiento) in the neighborhood or town where you live. You must prove you live there by showing a signed rental agreement (lease) with a duration of at least 6 months and proof that you’re paying rent. They will check to make sure that the owner on the lease really owns the property. If you don’t have a lease, go to the nearest Ayuntamiento and ask how you can prove your residence. Catch 22. You’ll need an Empadronamiento certificate. You need a lease to get one and you might need a NIE. If so, get a non-resident NIE first, sign the lease, get the empadronamiento certificate then get the Permanent NIE. Your NIE number never changes. What Do I Need to Get a Non-Resident NIE? It’s a short list because you won’t be living in Spain. Appointment confirmation if you are an EU citizen because you apply at the police station (comisaria). If you’re a not an EU citizen you won’t need this. A letter explaining why you need the NIE (Carta de Motivo). Ideally, this is a document from a Spanish Notary that explains why you need one: to buy property, accept employment, etc. However, some offices accept other documents such as a letter from a landlord stating that you want to rent a flat, etc. Note: You don’t need a bank statement, health insurance or an empadronamiento certificate because you are not living in Spain. 1) Taxes. With a resident NIE you must file an annual tax return in Spain reporting your worldwide income. If you file in your native country, you might get a tax credit for the taxes you paid in Spain. With a non-resident NIE you don’t have to file a tax return in Spain. If your spouse has a resident NIE, you might be considered a resident too, obligating you to file a tax return. Tax questions are tricky. Please talk to a Spanish tax attorney (abogado fiscal) before you, or your spouse, apply for a resident NIE. I can refer one. 2) A non-resident NIE does not allow a non-EU citizen to live or work in Spain. They can only live in Spain 90 days at a time or 180 days in each 365-day period. Your spouse or a child live in Spain. Then a presumption arises that you live in Spain too. You can rebut this with evidence that you live and pay taxes elsewhere. But beware, if your spouse is a resident you might be forced to pay taxes in Spain even if you don’t have a resident NIE. This issue comes up all the time.